GLENDALE, Ariz. (AP) — Josh Rosen fit balls into tight windows, hit receivers in stride, kept his poise in the pocket and under the pressure of making his first NFL start. Only one thing was missing: a win. 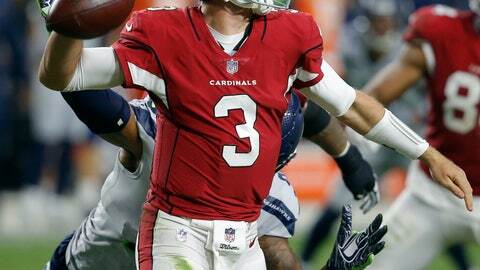 Plagued by miscues, dropped passes and a big missed field goal, the Arizona Cardinals spoiled Rosen’s debut as a starter with a 20-17 loss to the Seattle Seahawks on Sunday. Sebastian Janikowski kicked a 52-yard field goal as time expired after Arizona’s Phil Dawson missed a 45-yard attempt, dropping the Cardinals to 0-4 for the first time since 1986. The Cardinals planned to bring Rosen along slowly after selecting him with the 10th overall pick of the NFL draft, hoping he could learn the NFL ropes playing behind Sam Bradford. But with Bradford struggling through the season’s first three games, the Cardinals turned to Rosen in the fourth quarter of last week’s game against Chicago. Rosen threw an interception and had a pick-six erased by a penalty, but showed enough that first-year coach Steve Wilks named him the starter against Seattle. Rosen was off target on two throws and was sacked in Arizona’s opening drive before finding a rhythm and a bevy of receivers with on-the-mark throws. One problem: Some of his best throws fell to the ground. The Cardinals dropped at least five passes, including a ball to J.J. Nelson that could have gone for a long touchdown late in the second quarter. Rosen finished 15 for 27 for 180 yards and a 22-yard touchdown to Chad Williams, numbers that could have been far higher had his receivers held onto the ball better. Rosen had the preseason and nearly three games of watching to prepare for the playing in the NFL. He was poised during the 11 snaps he played against the Bears and, after some early jitters against the Seahawks (2-2), looked like he had been playing in the NFL all along, not making his first start. He also made good decisions, using his legs to escape pressure and throwing the ball away instead of forcing balls into tight coverage. For all Rosen did do, he still couldn’t lead the Cardinals to their first win in 2018. Rosen was solid, Arizona finally got David Johnson untracked (112 total yards and a TD) and the defense prevented Seattle from converting a third-down attempt. The Cardinals bumbled victory away with the dropped passes, two missed field goals by Dawson, a series of missed tackles and an inability to stop the Seahawks from setting up the winning field goal. Rosen also missed an open receiver in the end zone in the first half.